The term Hearts and Arrows (often abbreviated H&A) refers to round brilliant diamonds that have been cut to a very high degree of three dimensional symmetry, also referred to as “optical symmetry” or “optical precision”. Hearts and Arrows Diamonds examined in a special reflector device will show a distinct pattern of 8 arrows when viewed from the top, and a pattern of 8 distinct hearts when viewed from the bottom. *Other shapes including a style of cushion cut have been developed to display versions of H&A patterning, but for the purposes of this article we confine the discussion to the round brilliant. 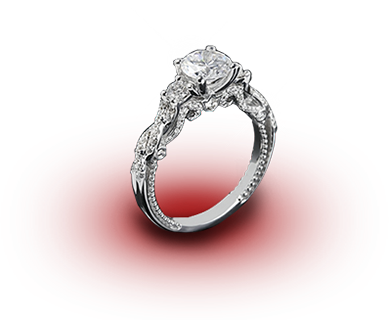 It is very difficult for the diamond cutter to achieve the level of precision necessary for hearts and arrows as it requires more skill, more time, and the loss of more weight from the original diamond rough. 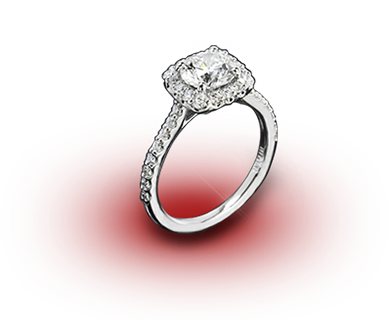 For these reasons H&A diamonds are significantly more costly to produce. Achieving optical symmetry requires an exacting process of making sure all of the tiny facets line up perfectly against their counterparts on the opposite side of the diamond. 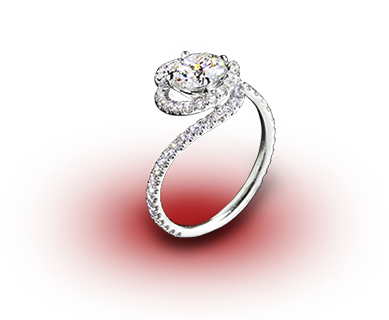 Only when a diamond is crafted so that each facet is in alignment with its corresponding facet in three dimensional space, will a well-defined pattern of hearts and arrows be displayed. Therefore, true Hearts and Arrows patterning is visual evidence of precision craftsmanship that has the potential to maximize light performance. 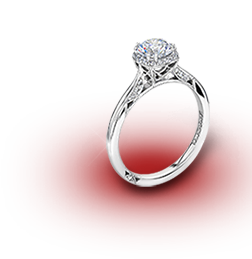 The benefits of H&A diamonds extend well beyond the patterns themselves. Below we will present detailed information about hearts and arrows diamonds including how the patterns are formed and how they are analyzed. 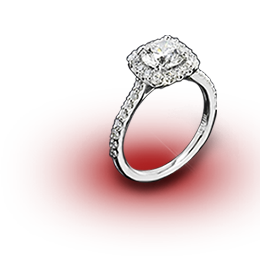 For those more interested in understanding what this all means from a consumer’s standpoint, please see our page on the benefits of H&A diamonds. Click below to automatically navigate to each section of this article. 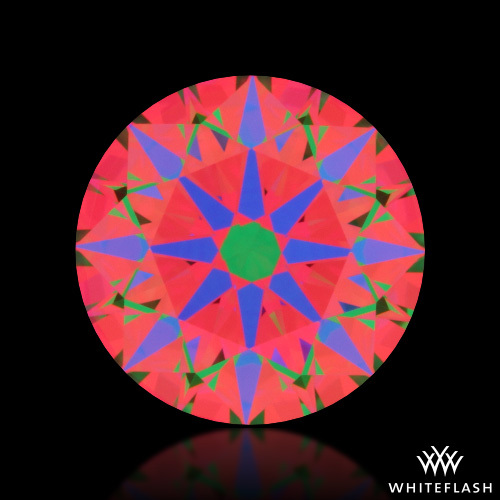 In the 1980s, Japanese diamond cutters were the first to produce round brilliant diamonds cut so precisely that their facet reflections overlapped in 3D space, creating symmetrical kaleidoscopic patterns when seen through reflecting viewers. Key developments included the invention of the Firescope® and the related founding of Eightstar® diamond company. By the 1990s hearts and arrows diamonds were gaining a following in the US market, being first seriously marketed by a sister company of EightStar. Others soon followed including Whiteflash in 2000 with the introduction of the A CUT ABOVE® Hearts and Arrows super ideal. 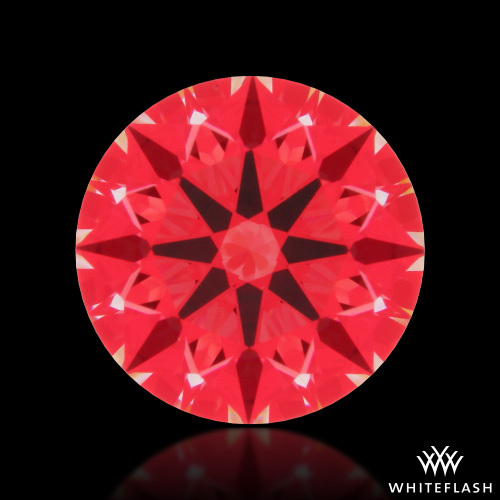 Whiteflash was among a small vanguard of retailers who brought widespread awareness to the market of the benefits of precision cut diamonds through advanced education and light performance imaging. The success of these initial offerings made clear that there was a strong demand among the new consumer market for diamonds of exceptional cut quality. Laboratory cut grading by AGSL and eventually GIA would enhance understanding and awareness of the importance of diamond cut quality, and would provide validation for the new precision cut diamonds appearing in the market. 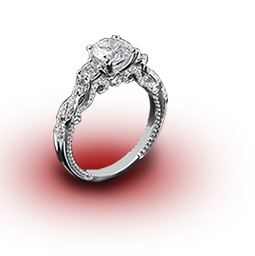 The movement would continue to gain momentum bringing many positive changes and improvements to diamond manufacturing, and providing many more options for consumers interested in top cut craftsmanship. For more background on hearts and arrows diamonds please see our page on the history of H&A. 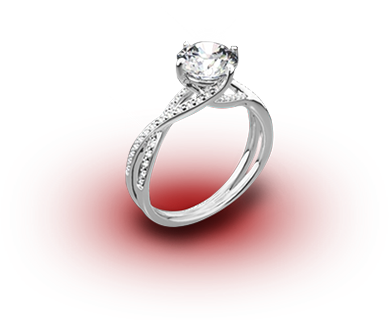 It is natural to associate hearts and arrows with ideal cut diamonds, but the two do not always go hand in hand. In fact, ideal light performance and optical symmetry are related but separate qualities. They can be thought of generally as proportions and precision. It is true that H&A patterns are only achievable through a relatively narrow range of proportions, most of which will result in good light performance. 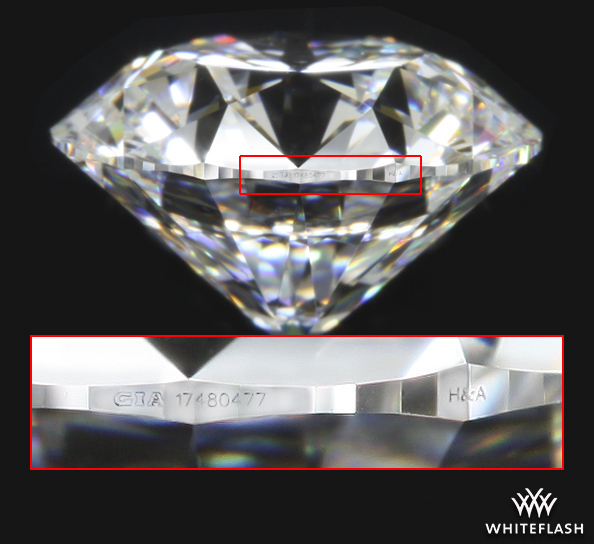 And while the level of craftsmanship required to create H&A is also an indication that a cutter is aiming for top performance, it is quite possible to achieve optical symmetry in a diamond with less than optimal proportions. Some proportion sets can result in light leakage and other performance deficits, even when optical precision is excellent. Achieving both simultaneously is the concept behind the “super ideal”. Hearts and arrows patterns are formed by the overlapping of various facet reflections as seen when the diamond is viewed from either the top or the bottom, with line of sight perpendicular to the table. Different patterns are displayed from each view due to the specific combination of facets that are reflecting and combining. The pavilion main facets are the primary engines of light return and the key components of both the hearts and the arrows patterns. The hearts patterns are the least forgiving of any errors in precision as they require more facets to form them. Even slight variances in cutting will result in irregularities in the hearts in terms of shape, size, or clefts. 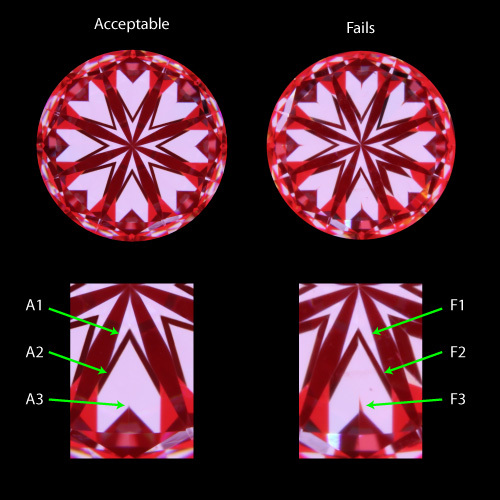 By evaluating H&A patterns carefully it is possible to visually assess the level of faceting precision. Cutting faults will result in deviations from an accurate and consistent pattern of hearts and/or arrows. Shafts of the arrows should align with the arrow heads, and hearts should be uniform in shape and size. Clefts between the lobes of the hearts should be minimal. In figure A, parts A1 (chevron), A2 (separation) and A3 the heart is well defined, the gap between the chevrons is distinct, and the split at A3 is minimal. Figure F fails to meet the criteria. Round brilliant diamonds will display varying degrees of H&A patterning ranging from none whatsoever to perfect patterning. Diamonds with distinct hearts and arrows patterning, even with some variation in size, shape or clefts are considered by most merchants today to be H&A. There is no universally agreed upon industry standard. However, a diamond cannot be considered super ideal without having a near perfect hearts and arrows pattern. For a more detailed understanding of the specific facet reflections involved and how they overlap and combine, please see our pages on hearts and arrows formation and grading. 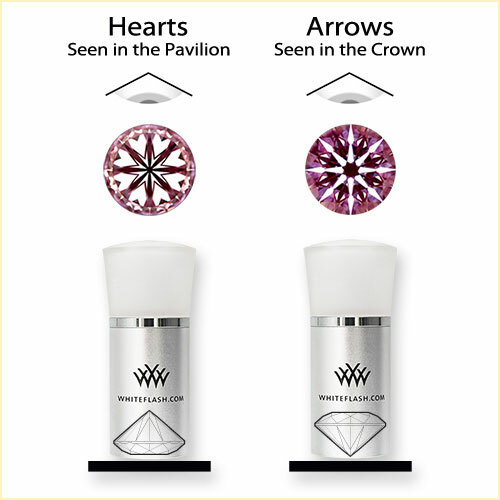 The difference between a true hearts and arrows diamond and one that does not have quite that level of optical precision may not be obvious to a viewer in a single comparative observation. The real value of elite precision can best be appreciated by observing the diamond over a period of time and many different lighting conditions. Top H&A patterning is indicative of precise alignment of the facets in three dimensions, such that the light transactions between corresponding facets is as sharp and crisp as possible. This optimizes the critical “virtual facet’ sizes and patterns to the fullest extent of the design. Larger virtual facets will give you bigger and more distinct white and colored sparkles, and transitions between brightness and contrast will give you sharper and crisper scintillation. The likelihood of observing fire is also improved in part because flash duration is not compromised by misalignment which tends to chop up virtual facets and make for chaotic and unintended patterns. Example of an ideal cut with poor hearts and arrows patterning. The value of the additional costs involved in producing a high precision diamond in terms of sacrificing weight and the extra time and skill required, is the fact that the diamond is “tuned” to an optimal level. This will be observed in improved optics that, while not obvious at first, come to be appreciated over time and remain a permanent and ongoing characteristic of the diamond. 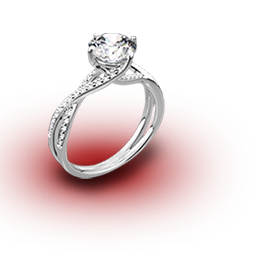 This is why many folks who have personally owned precision cut diamonds have difficulty settling for less. Benefits of Hearts and Arrows – What does it mean to the consumer? The facet precision evident in hearts and arrows diamonds is a strong indicator of excellence in craftsmanship. In addition to the pride of owning a diamond cut with a very high level of care and expertise, and besides the sentimentality of knowing the diamond displays tiny hearts that can be seen with a special viewer, there are tangible benefits to precision cutting. 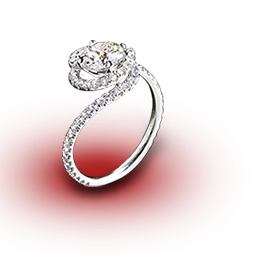 The benefits of H&A diamonds derive from a perfect execution of the facet design, optimizing the diamond’s light handling capabilities. To the extent that the diamond is proportioned and polished correctly, aligning the facets precisely in three dimensions enables each facet to do its specific job fully and completely. Brightness, contrast, and dispersion are thereby optimized. The highly structured and symmetrical scintillation patterns in and of themselves represent an aesthetic that the observer reacts to. The human eye and brain respond positively to objects with a high degree of symmetry. The right amount and distribution of contrast not only increases perceived brilliance, but creates scintillation patterns of the right frequencies to be comfortable for our brains and therefore visually appealing. Studies of human perception show that chaotic and unpredictable patterns are intrinsically less appealing to the human eye. 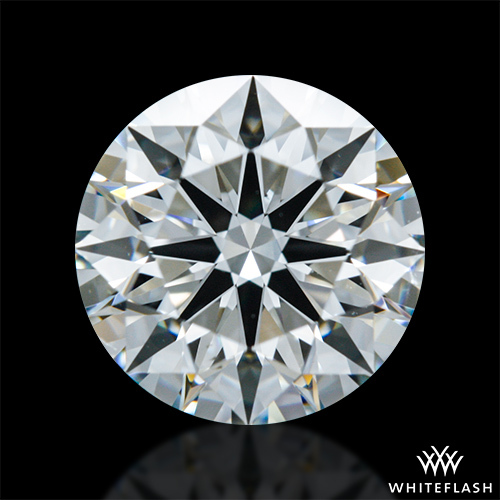 Whiteflash offers one of the largest in-house inventories of precision cut diamonds of any retailer on the planet. Our A CUT ABOVE® Super Ideal brand, as well as our Expert Selection category, both feature precision cut hearts and arrows diamonds. And our signature line of jewelry features A CUT ABOVE Hearts and Arrows Melee which are also used in many of our custom designs. While both of the top Whiteflash in-house categories (A CUT ABOVE® and Expert Selection) feature hearts and arrows precision, only the A CUT ABOVE® must pass our strictest grading standards. Expert Selection diamonds must exhibit a distinct hearts and arrows pattern but some variations within the pattern are allowed. For a complete understanding of why A CUT ABOVE® diamonds are considered by experts to be among the finest diamonds in the world, please see our specifications and qualifications page. Because both categories are at the top of the scale in terms of cut quality, it may be helpful to liken the differences to the distinction between colors in the colorless range. D, E, and F are considered colorless diamonds. But D is the best of the best and completely colorless, while F, without having any obvious color, is a little less colorless. A CUT ABOVE® is the ultimate super ideal. Expert Selection have the top lab grades for cut plus hearts and arrows patterning. They are what others call super ideal, but at Whiteflash we reserve that term for A CUT ABOVE®. The hearts and arrows viewer is a simple tool and very easy to use. It comes with an eye piece and a black base. The base is flat on one side and has a conical indentation on the other. Place the diamond table down on the flat side and place the eye piece on top of it. Look through the viewer to see the hearts pattern. Reverse the base and place the diamond pavilion side down into the indentation. Make sure the diamond is sitting straight on the base (table should be parallel to the base and perpendicular to your line of site). Place the eye piece on top of the diamond and base to see the arrows pattern. Note: Hearts and arrows viewers have marginal value in examining diamonds set in jewelry as it is not possible to see the all-important pavilion view to examine the hearts pattern. Laser inscription of diamonds is a relatively new feature. It is a handy tool for quickly identifying a diamond. 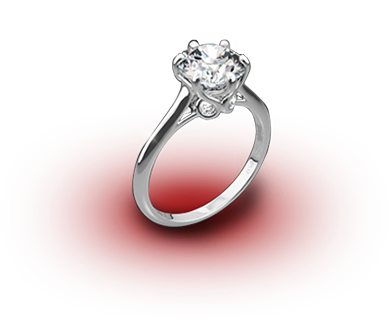 Most commonly the diamond is inscribed with a lab report number. Other numbers and symbols are also sometimes inscribed including logos and even “H&A”. But anything inscribed on a diamond needs verification. It is important to understand that inscriptions are often done by the manufacturer or by third parties at the behest of a diamond merchant. Therefore a designation of H&A amounts to a claim, but is not conclusive until independently verified. You may see “H&A” mentioned on either an AGS or GIA report under the ‘Comments’ section. This is NOT verification that the diamond is indeed true hearts and arrows. It is simply a statement that diamond had those letters inscribed on it when it was submitted to the lab. 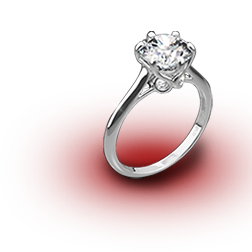 Neither AGS nor GIA currently grade hearts and arrows, therefore assessment of the level of H&A requires either inspecting the diamond with a hearts and arrows viewer or analyzing images captured with an H&A device. 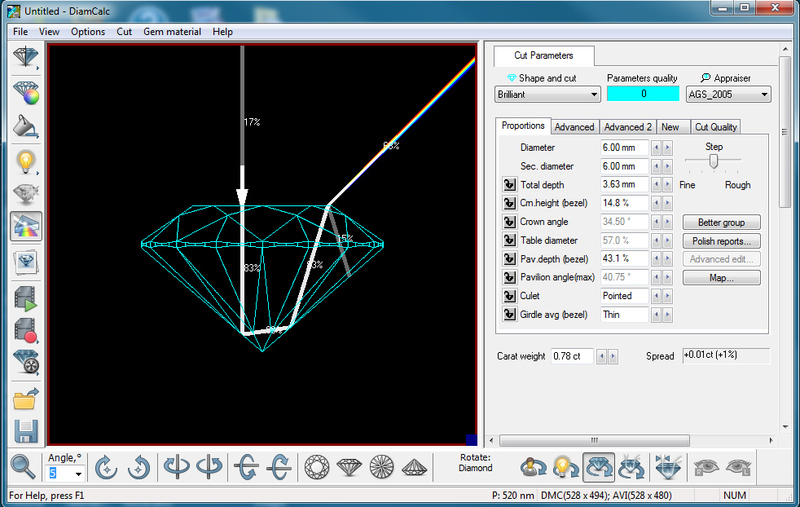 Software programs such as the DiamCalc and AGS light performance software have the capability of rendering a variety of light performance images directly from a 3D measuring device such as Sarine or Helium scan. These images, including a hearts and arrows view, can be very close to actual photos, providing that the scans are accurate. However, it is important to understand that DiamCalc renderings can also be generated using basic data points from a lab report. 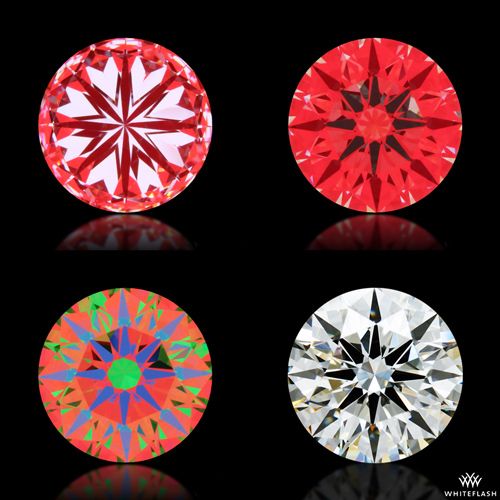 In these cases, the software assumes perfect optical symmetry and will produce images that may look very different from a real photograph of the actual diamond. The data on lab reports are averaged and rounded (GIA more so than AGSL), which adds a further margin of error. Because computer generated images have the appearance of actual photos, it is important to verify with the merchant if the imagery they are providing is actual photography of the diamond, or computer generated. And if computer generated, whether it is the product of a 3D scan of the diamond or the inputting of data from lab report. AGSL reports can contain light maps including ASET (Angular Spectrum Evaluation Tool) that will show these patterns. On the Platinum certificate, an ASET map is included which will show an arrows pattern in blue. 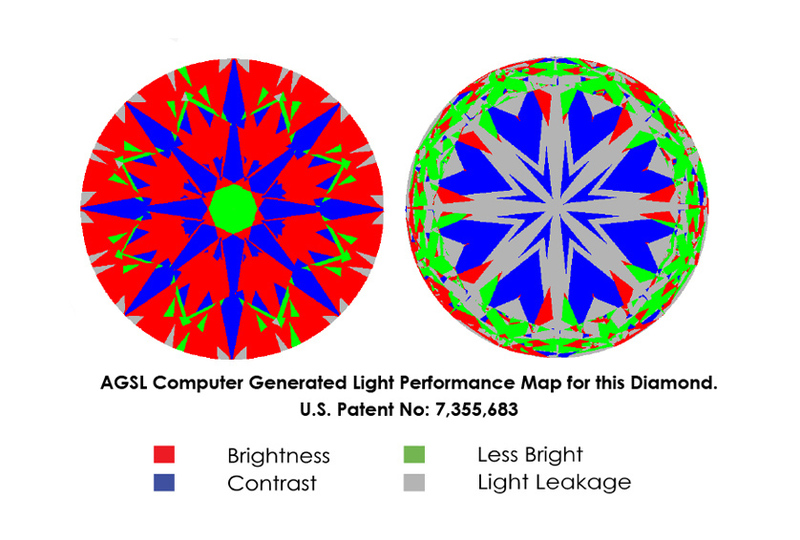 On “dual light map” certificates, there is also an ASET image of the bottom of the diamond which will show the hearts patterns. Because these images are made from 3D scans done at the lab, they are very representative of what an actual H&A image of the stone will reveal. AGSL also has a related software program called Visual Proportion Analyzer (VPA) that uses the 3D scan to produce a graphical view of facet precision. The images produced show in a color coded way specific deviations in angle and azimuth. The VPA software is offered for free on the AGSL website. 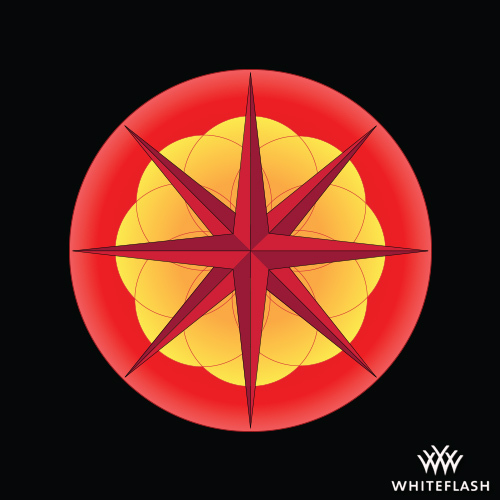 Through the ages and across civilizations, particularly in Asia, eight fold symmetry has been associated with the highest forms of spirituality. In Hinduism and Buddhism the “Eightfold Path” to enlightenment is represented by the Dharma wheel. The number eight is also considered auspicious in many Asian cultures, representing good luck and fortune. It is perhaps not surprising that the eight fold symmetry of the hearts and arrows diamond would evoke similar feelings of a higher calling, especially considering the emotional nature of diamonds as a gift of love and a commitment to an eternal bond. Simply put, many feel that this precise patterning within the diamond design is very good karma!